Just a short walk or even shorter bike ride to Cambridge city centre places Nido Castle Hill in the perfect location to take advantage of everything the city has to offer. Home to over 60,000 students from the University of Cambridge and fellow campus Anglia Ruskin University, Cambridge is known for its prestigious academic history, traditional market town, and former home to some of the world’s greats. Our brand new residence is home to 102 UK and International students each year. Our Studios and Ensuite-Apartments come fully furnished with everything needed for stylish, convenient, studying and socialising. Each Studio comes with a private ensuite bathroom, kitchenette, storage and dining table & chairs, ideal for having your own space. 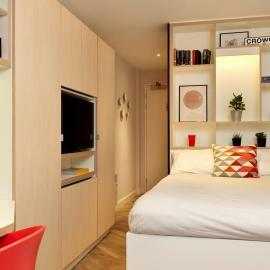 Our Apartments allow you to enjoy the buzzing atmosphere of a shared living room and kitchen while still having the privacy of your own bedroom and ensuite bathroom. Create your ideal space by selecting your preferred room size, window view and bedroom layout. 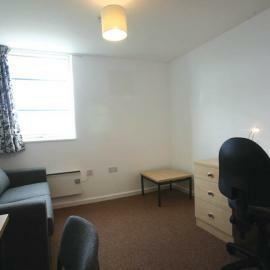 Rooms for the 2017/18 academic year start at just £197 pp/pw.